1. Meeting called to order by Vice President (V.P.) Jay Simon at 2:10 PM. 3. February meeting minutes approved without amendment. A. Next meeting V.P. will show how to make link on Facebook to post our upcoming Orchid Show in May. B. We will have 2 public classes per year and next one is March 23, 2019. C. Save AOS magazines to give away at show. D. Johnita Turner wanted club input to have a reception after show instead of banquet. Show of hands preferred reception. B. Great Plains Judging Center- January had 19 plants judged; February had 10 plants judged; March had 12 plants judged. C. AOS representative showed “Orchids” magazine -great place to renew membership in magazine. D. SWROGA- OOS had 10 plants at last show. Won numerous awards. Next show is Sept. 13-15 in Clearwater, TX. E. Orchid Digest representative- Still room for members. F. OK Garden Council –No report. G. Conservation-Mike Friday not present by Allen Koch presented letter from Rainforest Trust thanking OOS for $250.00 donation. H. Upcoming Show/Sale- Still need lots of help –Listed areas still available to volunteer for and spoke about clerking Saturday. Jana will be calling people not signed up yet. There are 5 members, 2 societies and 6 vendors signed up so far. If need a round table without electricity still available. Sign-up by April 19th, 2019. Hospitality- needs food for Saturday (Fiesta with Cinco de Mayo type affair for food.) Please sign-up (will feed up to 40 people). 11. Meeting adjourned at 3:30PM. 2. Douglas Needham Ph.D. V.M.M. was thanked for his very informative presentations on Water Quality and Media Relations and Integrated Pest Management. a. Consideration for changing our annual show back to the fall when Garden Center room rental agreement renewal is due. It was also posed that OOS could have a one day orchid sale in the spring and then the full show in the fall. Members were encouraged to consider the pros and cons and bring feedback. a. Keith Warren was presented with the Orchid Digest Diamond Award for his appreciated work for OOS. b. Kansas Orchid Society has a trip planned to Ecuador. Anyone wanting more information should contact Bryon Rinke, Kansas Orchid Society. e. OK Garden Council – Festival in the Park will be Saturday, 5/18/19. It was motioned and approved by vote that OOS participate and pay the fee including the cost of tables. Need members to help that day. Set up starts at 7:00 am; open to public at 9:00 am. OOS will be located inside the Senior Center. f. Conservation – It was motioned and approved to donate $250 to the Rainforest Trust towards the purchase reserved acreage in Ecuador; there will be matching corporate funds. Mike Friday is working on developing a preservation project for orchids native to our area of the US. More information to come. g. Upcoming Show/Sale - Lots of help still needed. Specific needs were listed. There will be 4 orchid vendors and 1 non-orchid vendor. There will be an “Open Exhibit” table for person wanting to have their orchid judged but are not a member of a society. Johnita Turner called the meeting to order around 2:00pm after Green Growers presentation by Jay Simon and snacks. The minutes from the November meeting were accepted without changes by acclamation. Allen Koch presented the Treasurer's report. Approved as stands. Old business: Garden Center been paid? No, OOS has not received an invoice from the Garden Center yet. New business: Carolyn McCabe spoke about the design specialty show-Need everyone to put in 1 entry for the May show. OOS provides orchids to use for your entry. Karen Marichal stressed May show exhibit set-up needs need to be submitted to her. c. Howard Brown (AOS Rep) Spoke of being a member benefits-Magazine with great articles. e. Burrel Gambel (Orchid Digest Rep) spoke of joining for $39 a year or $79 for 2 years. All staff are volunteers. Allen Koch reported OOS received a thank you note for our $100 donation last Oct. Howard brown said the publication was Quarterly. f. Johnita Turner - Garden Council – No new news –Senior Center will be used for Flower and Art Show (Festival in the Park). Jay Simon held program “Seeing Red.” –Cattleya coccina and its use in red breeding. Greenhouse tour hosted by Gerry Holland at her home. Weather and illness kept many from attending. Regular meeting was held at Johnita Turner's home. Again, weather and illness caused turnout to be relatively low. Johnita called the meeting to order around 3:00 after snacks. The minutes from the October meeting were accepted without changes by acclamation. Allen Koch presented the Treasurer's report and there was some discussion around the fees for Garden Center which have not been paid because OOS has not received an invoice. Keith Warren said the Bonsai Society also has not received a billing and there is apparently some holdup in the OKC Parks Department. Jana Butcher reported on SWROGA. Greater North Texas Orchid Society will host a show in March, 2019, in Richardson, Texas. Members were reminded that Gabriel, who is handling the website for OOS, has posted videos from past meetings. Gabe has done an excellent job with the website and these videos are valuable for members who are unable to attend meetings or who missed a program in the past. Howard Brown - reported on AOS as well as Great Plains Judging. This past week there were 23 plants presented for judging. Burrel Gambel - no Orchid Digest report. Members were reminded that OOS donated $100 to Orchid Digest last month. Johnita Turner - Garden Council - lighting ceremony will be held November 25 at 5:00 in the conservatory. Members voted on the 2019 show poster and Jana announced that the poster submitted by Gabriel Guerrero was the winner. Members can retrieve the poster from the website and have some printed to distribute. Discussion on 2019 show advertising because The Oklahoman has greatly increased their rates, and the ad hasn't been given proper space to be noticeable. Further discussion on this later. Taiwan International Orchid Show information is available by contacting Allen Koch. Allen will begin accepting 2019 dues beginning now. Christmas party will be held at Johnita's home on December 8. Bring a gift valued at $15 or more or Dirty Santa, as well as a covered dish. Red River Christmas party at Parkers' home will be December 15, gift and covered dish for this also. Let Parkers know how many will be coming so they can prepare accordingly. Allen will be driving if anyone wants to ride with him. Motion was made to confirm these members and seconded. Accepted by acclamation. breeding in Taiwan, which focuses on commercial applications. The second presentation was on growing dendrobiums and their growing habits. Johnita Turner called the Business Meeting to order. September minutes as well as the treasurer's report were presented and accepted by voice vote. Jana Butcher reported on the Shreveport SWROGA Show. OOS was well represented and some members were awarded several trophies. The Dallas SWROGA Show will be the second weekend in March. "Orchid Fiesta" is the 2019 OOS Show theme and Jana reminded everyone that entries in the poster contest are needed for that show. Howard Brown - no report for AOS or Judging Center. Allen Koch reported on Orchid Digest, which is a voluntary organization, needing donations to continue their work. Johnita suggested OOS donate $100 to Orchid Digest and it was approved by voice. Volunteers are needed at the Garden Center in the conservatory on 10/23 and 10/27. Johnita also reminded members that we need volunteer hours at the Garden Center to defray costs of meeting room rental fees. The Red River Christmas Party will be at the Parker's on December 8. The OOS Christmas Party will be at Johnita Turner's on December 15. Dirty Santa gifts of value of at least $15 should be brought to the parties, as well as food items. 2019 OOS officers will be voted on at the November meeting. Following Show and Tell, and raffle, the meeting was adjurned. For the month of November we will be having our annual Greenhouse Tour visiting Gerry Holland's beautiful greenhouse at 1:00 pm. Gerry's address will be provided via email. August 19, 2018 in the Oklahoma City Garden Center by Facilitator Name. There were 26 present, and no guests. highlighting the sections covering orchid diseases. available on the OOS website. Howard Brown reported on AOS and Judging. Garden Clubs – no report. will receive the funds from the sale of plants and other items donated by OOS members. Center, in the west parking lot, to set up tables and displays at 7:30 a.m.
programs, Fred Clarke. Members are asked to be there early to set up tables and chairs. Fred.Clarke@att.net with “pre-order for your Oklahoma City visit” in the subject line. It was decided that no raffle will be held at the September meeting. Lowell and Carolyn McCabe auctioned 2 orchids. Carolyn McCabe asked for volunteers to act as officers for the upcoming year. the art of judging orchid by scents. in the Garden Center. BE THERE EARLY TO SET UP. 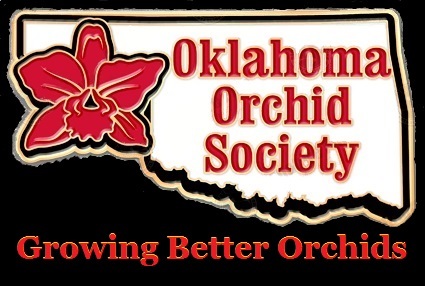 The regular meeting of the Oklahoma Orchid Society was called to order at 1:00 on July 15, 2018 in the Oklahoma City Garden Center by President Johnita Turner. There were 26 present, including 1 guest. Conducted by Vice President Keith Warren who presented a webinar from the American Orchid Society “Orchids and their Management,” in particular the sections covering orchid diseases. Carolyn McCabe offered an educational program on Vandas titled “What’s Up With Vandas?” and covered hybridization. There was also a discussion of award designations when plants are hybridized. The minutes of the previous meeting were approved as read with no changes. Johnita pointed out that all minutes and treasurer’s reports are available on the OOS website. Allen Koch reported on the 2018 Show and Festival in the Park final figures as well as the monthly treasurer’s report. The reports were approved as read. Burrel Gambel offered the Orchid Digest report. Johnita suggested that since the Orchid Digest is a volunteer group, the OOS should consider a donation to them. No action was taken at this time. 2019 Show report – 60 hours of volunteer time is needed to cover the rent for the 2019 Show and Sale. Call Jim Wolley at the Garden Center, who handles volunteer activity at the park, to arrange to volunteer. The volunteers in June cleaned out a storage space and a number of items were saved that could be offered in a garage sale. Johnita suggested having a garage sale in the parking lot in September or October. She will check with other clubs to see if they would also be interested in participating. Proceeds would go to the Garden Clubs. We will discuss further in upcoming meetings. There are several items belonging to the OOS that have been stored in the home of a member that must be moved, but there is no room in our cabinet at the Center to hold it. Jana volunteered to allow the materials to be stored in her storage facility for $25 per month until other storage arrangements can be made. Motion made and seconded, voted by acclamation to pay Jana Butcher for storing items and things will be moved today. Johnita asked for 3 volunteers to be on a committee to put forth nominations for officers for 2019. Carolyn McCabe, Bill Parker and Audrey Ripper are the committee members. Volunteers were also requested to co-chair the 2019 Show. Jana Butcher and Jay Simon are co-chairs. Jeannie Simon volunteered to chair the Hospitality for the Show. OOS subscription to AOS resulted in a certificate for $30 off a $100 purchase to several vendors in the magazine. It was decided that the certificate would be placed on the raffle table. Meeting was adjourn3d by President Johnita Turner. The next general meeting will be at 1:00 on August 19, 2018, inthe Garden Center. The green growers meeting was called to order at 1:10 pm. Keith Warren introduced Jana Butcher and Gerry Holland with their program. Repotting Orchids. Use of Styrofoam packing peanuts was mention. The regular business meeting was called by Johnita Turner at 2pm. The meeting had 4 new members and 1 guest attending. The new members signed up at the Orchid Show. The membership welcomed their attendance. Allen reported that the Show Report (2018) was not available yet. All bills have not been received and paid. The Festival Report will be available in the future. OOS made small profit. OKC Garden Council - No report, closed for summer. AOS report - no report. Orchid Digest - no report. Great Plains Judging Center - No report. The monthly meeting is not until the following Saturday. Misc. Report: - Jana Butcher presented a list of dates reserved at the Will Rogers Garden Center. President Report - Johnita talked about volunteer hours. It was noted that the calendar year for Will Rogers close June 30, 2018 at 11:59 pm. Hours for 2019 close at that time. We need to do more volunteer hours to help pay for the 2019 Show. The Throphy OOS won at the Tulsa Show was presented. Old Business - no report. New Business - The following OOS show procedure change was introduced. A new show procedure was introduced to the membership. (Society or Group Class (es)) all exhibitors must be current on dues payment. As outlined by the OOS ByLaws dues payment year is January 1st through December 31st of the current year. The motion was voted upon and passed by the membership. and the membership of the OOS were invited. The meeting adjourned around 3:45 pm. Minutes submitted by Allen Koch as acting secretary. AOS Webinar of a Q&A session on various orchid issues with questions submitted by viewers. Johnita Turner called the regular meeting to order. Allen Koch presented the treasurers report and it was approved. There will be a tour to Bustani Plant Farm in Stillwater through the Garden Council the second week in April. More information later. Festival in the Park is May 19th. The Garden Council plant sale is at the end of April and they are asking for donated plants. There was no Orchid Digest report. Carolyn reported on SWROGA Tulsa Show. OOS needs plants to use in our display at the show. The Show is April 21 and 22. Jana reminded everyone of the need for silent auction items and old AOS magazines to give away at the OOS May show. Members were again asked to review the sign up sheets for volunteers at the OOS May show. Candy will be doing the show installation for OOS and will need plants for the show by 1:00 on Friday before the show. Johnita discussed the credit system the Garden Center will be using to give OOS credits toward rental costs in the future. Regular business meeting was closed. Keith introduced business OOS members Brian, Lowell, Burrel and Bill who participated in a panel discussion of questions submitted by the attending members and guests. Minutes provide by Carol Ash.